We encourage you to share your favorite trees or your biggest planting failures via the treeselector. Post a review and picture. If any tree isn't included (to see the complete list, just click "Find a Match" with no qualifications) send us your recommendation at urbanforestry@vt.edu. Through your participation, the Virginia Street Tree Selector will continue to grow and improve. Appleton, B. L. and L. T. Chaplin. 2001. The New York/Mid-Atlantic Gardener’s Book of Lists. Taylor Trade Publishing, Dallas, TX. Dirr, M 1998. Manual of Woody Landscape Plants, 5th ed. Stipes Publishing, Champaign, Illinois. Bassuk, N. L., D. F. Curtis, BZ Marranca, and B. Neal. 2003. Recommended Urban Trees: Site Assessment and Tree Selection for Stress Tolerance, Urban Horticulture Institute, Cornell University, Ithaca NY. Gerhold, H. D., W. N. Wandell, and N. L. Lacasse, Eds. 1993. Street Tree Factsheets. 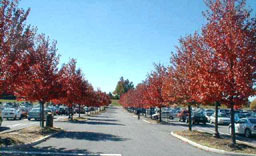 PennState College of Agricultural Sciences, State College, PA.
Gilman's Tree Selector. Details on the culture of many woody plants are available at this web site by Dr. Edward Gilman of the University of Florida. Your review: We ask that you include specific information about where trees were planted (soil conditions, etc.) when they are mentioned in your review. By providing content to our site, you have granted Virginia Polytechnic Institute & State University (VPI & SU) unrestricted use of that material and grant permission to post your review with your name, title, city and state. Your E-mail address will not be revealed to other entities by VPI & SU without your permission. We reserve the right to modify, reproduce and distribute materials posted to our services, both internally and for non-commercial use. We have the right, but not the obligation, to remove or edit any content submitted to this site. Information that you place on the Street Tree Selector must be your own original content. You are responsible for assuring that any material (text and images) you provide does not violate, plagiarize or infringe upon the right of any third party, including copyright, trademark or proprietary rights. If non-original content is included in your posting, you must obtain permission from the content owner and provide due credit. Information contributed represents the views of the person submitting the review and is not necessarily endorsed by us. The following people have provided photographs, content, guidance, or resource material concerning the Virginia Street Tree Selector and we gratefully acknowledge their participation. –Susan Day, Research Assistant Professor, Urban Forestry and Andrew Meeks, Programmer. We gratefully acknowledge the sponsorship of the Virginia Department of Forestry through its Urban & Community Forestry Grants program for the construction of the Virginia Street Tree Selector. Q. How does the Tree Selector use the information about the size of the planting site? A. The Tree Selector uses a variety of data to suggest trees that will grow in the soil volume provided by your planting site. The size of the planting site, the soil compaction level, the tree’s ability to escape planting pits, and the presence of structural soils or other break-out systems all affect the size tree that can be grown in a given site. The Tree Selector uses these data and the expected ultimate dbh (trunk diameter at 4.5 feet above ground) of each tree species to create a list of suitable trees. It is important to understand that the expected ultimate dbh attributed to each tree is NOT the genetic potential of that tree. For example, a Ginkgo biloba could reach 4 or 5 feet dbh if growing conditions were ideal. However, as a downtown street tree (the focus of the Tree Selector), 24 inches dbh would be a reasonable ultimate size—not necessarily the full genetic potential, but representative of a long-lived and serviceable street tree. Q. What is “usable soil volume”? A. Usable soil volume describes the amount of soil available for tree root growth. For example, if a tree is planted on a severely compacted clay soil, the usable soil volume will be only the soil disturbed during installation or a few inches on the surface loosened by mulching—perhaps less than 2 or 3 cu. ft. Tree roots grow primarily in the top 2 feet of soil, and most grow very near the surface. For this reason soil below 2 feet would not be considered in soil volume calculations in most cases. For example, if a tree is planted in a sidewalk cutout that is 4 x 4 feet and the soil is uncompacted, then the usable soil volume could be considered to be 4 feet x 4 feet x 2 feet deep, or 32 cu. ft.
Q. How much soil volume do trees need? A. Large shade trees in downtown settings rarely, if ever, have sufficient soil volume to grow to their full potential size. Many models for predicting the volume of soil required have been proposed. In our region, a useful rule of thumb is that each inch of dbh (trunk diameter at 4.5’ above the ground) requires about 20-25 ft2 of open ground with uncompacted soil. However, you will find that this amount of soil is rarely provided. Trees do survive, but do not reach their expected size. A tree may establish and grow normally for a few years. Then, when there is no longer enough soil for the tree’s increasing size, growth dramatically slows and the tree declines prematurely. Some trees are able to overcome the situation by rooting under sidewalks and through cracks to access adjacent lawn areas. Q. What are some of the models for calculating soil volume and how do they differ? A. There are several available soil volume models (listed below). As an example, let’s look at a 24” dbh Zelkova serrata with a crown spread of 50’. Using the Lindsey & Bassuk model, this tree would require about 2200 cu. ft. in a typical soil in Blacksburg, Virginia. The Urban et al. model would predict about 1500 cu. ft. would be required. The Natural Forest method based on upland hardwoods in the Eastern U.S., would predict that between 2700 and 4100 cu. ft. would be required, depending on soil quality. The rule of thumb mentioned above (each inch of dbh requires about 20-25 ft2 of open ground with uncompacted soil) would estimate 960 to 1200 cu. 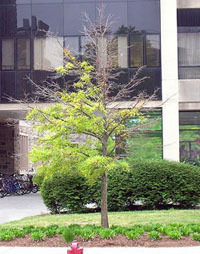 ft. To some extent, results will depend upon the species, as some species, such as Zelkova, are better able to exploit soil resources under pavement or in compacted areas. The larger soil volumes will support a healthier, more vigorous tree, but these volumes may be unattainable in restricted downtown areas. Lindsey & Bassuk. This model uses evapotranspirative demand, rainfall data, soil water holding capacity and leaf area index to calculate the amount of soil needed in a given climate to support the water demands of a tree of a given size. See Lindsey, P. and N. L. Bassuk. 1992. Redesigning the urban forest from the ground below: A new approach to specifying adequate soil volumes for street trees. Journal of Arboriculture 24 (3): 25-39. Urban et al. This model is for the Eastern U.S. and is based upon the tree’s canopy spread and dbh. It was developed using data from a number of authors and the experience of this urban tree expert. See Urban, J. 1992. Bringing order to the technical dysfunction within the urban forest. Journal of Arboriculture 18(2):85-90. Natural Forest. This method is derived from stocking charts for upland hardwoods in the Eastern U.S. (USDA Forest Service Ag. Handbook 355). We assume that density-induced stress begins at approximately 100 ft2 of basal area per acre. Q. Why do I get no trees when I put the size of my planting site in my search? A. Your planting site may be too small or your soil conditions so poor, that it will not support tree growth for long. You can either modify your site to improve it, or plant trees that will have a severely shortened life span. If you cannot modify the site, enter criteria for a somewhat larger planting site. You can plant these trees in your site, but you must recognize that their ultimate size and lifespan may be severely curtailed. Q. What is soil bulk density? A. Bulk density is a measure of soil compaction. It is the oven-dried weight of an amount of soil divided by the volume it occupied in the ground. Bulk density is usually expressed in grams per cubic centimeter (g/cm3). In mineral soils (i.e. not organic-based potting media), bulk density is typically between 1 and 2g/cm3. Bulk density is usually measured by taking undisturbed core samples of known volume and drying them in an oven at 100-105 C. The net dried soil weight is then divided by the volume. You can also measure bulk density by digging a small hole and collecting the soil. Then place a plastic bag in the hole and fill it with water. Measure how much water it takes and this will give you the volume. Then dry the soil in an oven set at roughly 100 C (180 F) and again divide the weight by the volume. When soil texture is also known, bulk density provides an accurate assessment of soil compaction level. Q. Why does the Street Tree Selector ask for the soil texture at my site? Q. Why can’t I find some trees in the Tree Selector database? A. The Tree Selector is designed to provide you with a list of suggested trees for highly built environments. Trees that are not recommended for such sites because of severe disease problems, high potential for invasiveness, or other problematic characteristics, are not included. Trees that are unlikely to fit the requirements of such sites because of there large size or form are likewise not included. If you have a tree that you would like to recommend for inclusion, please contact us. Q. I live outside Virginia, can I use the tree selections from your site? A. The Tree Selector is designed for Virginia. It can be used to generate tree lists for other parts of the country, but we recommend that you thoroughly research all proposed trees. Some of them may not be suitable for your area either because of differences in climate, or because of regional disease or insect issues. Furthermore, the potential for exotic trees to invade surrounding natural areas can differ by climate. Q. What is the “urban zone”? A. The urban zone is just the term we use to ask you which physiographic region of Virginia your tree will be planted in. The Mountain, Piedmont, and Coastal Plain regions vary widely in climate, and species should be selected that will do well in these varied climates. On the Coastal Plain, heat tolerance should be considered and in the mountains, cold hardiness is very important. As always, we recommend thoroughly researching unfamiliar trees proposed by the Tree Selector by referring to a reliable source such as Michael Dirr’s Manual of Woody Landscape Plants. A tree is a long term investment—a careful choice has a much better chance of providing long-term satisfaction. Q. What is structural soil? A. Structural soil refers to a group of soil mixes that are designed to be both load bearing AND to support tree growth. Because they are load bearing, they can be used under pavement, including streets. They typically function by using large gravel or similar material that form a lattice work that provides the support needed to hold up pavement. A good topsoil is mixed in and fills the voids between the gravel, providing uncompacted growing space, moisture and nutrients for roots. Structural soils can greatly increase rooting area for urban trees. Although many municipalities plant trees directly in structural soils, they can be confined to the underpavement areas with ordinary soils used in the open “tree pit” areas. Many structural soils (such as those made with limestone gravel or Carolina Stalite) have high pHs and appropriate trees need to be selected. There are several types of structural soil: CUSoil™ [leaving VT] was developed at Cornell University and can be made with local materials by a licensed contractor. Carolina Stalite [leaving VT] is an expanded stone material that can be mixed with topsoil to produce a structural soil. Other types of structural soils are also available in some regions. Q. What happens when tree roots get very large in structural soil—will they buckle sidewalks? A. Structural soils appear to have the added benefit of allowing tree roots to grow deeper in the soil profile—so they are less likely to exploit the area of low resistance between compacted soil and pavement that exists in some sidewalks. As tree roots expand, the gravel has been observed to become embedded in the roots. Root morphology does change somewhat as roots grow around the gravel lattice—but root expansion is ultimately not impeded. Trees can be planted directly in structural soil with pavers coming up to the tree trunk. However, by planting in ordinary soil with structural soil under adjacent pavement, trees may establish better and buttress roots may be better accommodated. Tree species vary considerably in their minimum requirements for rooting volume, pH, etc. Without knowledge of the planting site and the silvics of a variety of species, communities often choose broadly tolerant and overused species such as Bradford pear. It is good practice to match species with site and diversify the species composition of a community. Some site improvement can be made in many cases. You may need to Modify Your Site with subsoiling, tilling, grading, drainage, soil amendments, soil replacement, or other site preparations. Plants should then be selected that can tolerate the current or improved site conditions. Adapting the planting design to counteract site problems and better accommodate trees can also relieve some site limitations. Careful coordination of site conditions, tree selection and design adaptation will improve success. Soil conditions are often the most limiting factor for tree growth in downtown areas. In order to use the largest selection of species and provide the greatest potential canopy cover, the ability of the site to support tree growth must be maximized. Common site limitations and techniques for addressing these limitations need to be considered. After improving site conditions, a search in the street tree selector should provide you with many more species choices. Click on one of these buttons for specific information in this process. This red maple has reached its maximum size for this planting site. Although the tree survives, it will never reach its genetic size potential. The tree has been growing on this site for 10 years. It is 6 inches in diameter and has yearly shoot growth increments of less than 12 inches. These trees look reasonably healthy in early spring, as in this picture, but show premature fall color and dieback by the end of the summer. Include design elements such as benches or decorative walls that direct pedestrian and vehicular traffic away from tree root zones to prevent compaction of exposed soil. Include pavement-supporting, tree-friendly structural soils, such as CU Structural Soil®, Carolina Stalite, and other similar systems as root break-out zones under pavement. 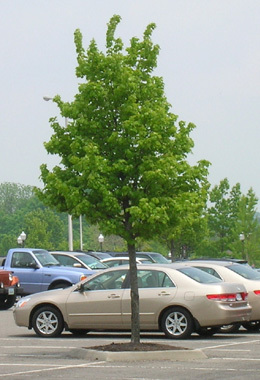 Provide strategically placed structural soils to allow trees to send roots under a paved area, such as a sidewalk or section of a parking lot, to adjacent open soil. Reducing soil compaction will have the added benefit of improving water infiltration into the soil profile—providing more water to your trees and less to the supply of urban runoff. Problem: A severely compacted median in a wide roadway is to be planted with large shade trees as part of the entrance into downtown. The median is 12 ft. wide. Its soil is primarily a clayey subsoil, heavily compacted by road machinery during construction. Even in this wide median, usable rooting volume for a tree is about 300 ft3. Solution: Subsoil tillage loosens lower layers. Two inches of municipal leaf compost is spread over the surface and tilled in thoroughly with a rototiller to a depth of 6-8 inches. During tilling, debris is removed. Soil with excessive stones or gravel is screened. Soil is now relatively uncompacted, and usable tree rooting volume within the median has been increased to about 1200 ft3. This is a one-time activity that will pay dividends for many years. Most trees grow best in neutral to somewhat acid soils (pH 7 and below). Some, such as pin oak and willow oak (Quercus palustris and Q. phellos ) will decline rapidly when soil pHs are above 7. In downtown settings, where concrete is abundant and limestone gravel may be mixed in the soil or used as a base layer for pavement, soil pH can be very high (alkaline). These high pHs limit nutrient availability to plants and often result in chlorotic (pale green or yellow) leaves. Fortunately, there are some species that will tolerate these higher pHs and these are often selected as street trees. You may want to consider adjusting the pH of the soil at your site in some situations. Alkaline soil (high pH) is the most common problem with street trees. Generally, the more clay in a soil, and the more widespread the sources of alkalinity, the more difficult it is to lower pH... and it is likely to return to its present level in the long term. Consider a clayey soil with a pH of 7.2 that has limestone gravel from a nearby sidewalk mixed in. To lower that pH we would have to remove the limestone gravel and till in agricultural sulfer according to the table below (pounds per 1000 square feet) (source: Virginia Cooperative Extension). Note that microbial activity is required, so warm and moist conditions are required for fast action. A thorough site evaluation should tell you how well a proposed planting site will be able to support street trees and what specific site limitations are. This Site Evaluation Form will guide you through this process. After the site evaluation is complete, select appropriate species and cultivars. The specific site for each tree should be considered to make sure a plant selection is made that will thrive in that spot. Our aim is to provide a useful tool for greening Virginia’s communities. If you have suggestions or would like to report an error in the database—please give us your feedback.